- Island Pakages with Cruises. 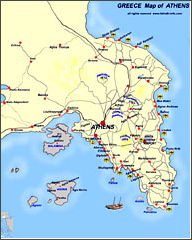 - Athens Land Tours Packages. Transfer to the port. Embark on the ship. Sail, 11:00am, to Mykonos, (6:00pm - 11:00pm). Today we visit two ports. Kusadasi, (7:00am -12:00pm) and Patmos, (4:00pm - 9:00pm). Today we visit Rhodes, (7:00am - 6:00pm). We visit two ports. Heraklion, (7:00 - 11:30am) and Santorini, (4:30pm - 9:00pm). Arrive at the port at 7:00am. Disembark, transfer to the Hotel, (on your own).